This review first appeared in the February 14, 1997 issue of the North County Times. Bassist Bob Nieske writes and plays jazz that is offbeat without being noisy. It's funky, yet listenable; it's challenging while still accessible. 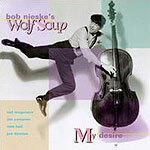 "My Desire" features nine originals by Nieske, plus two covers: "Misterioso" by Thelonious Monk and "I've Found a New Baby" by Palmer and Williams. The two covers are the most linear compositions performed here by Wolf Soup, Nieske's quintet (bass, drums, guitar and two saxophones). Nieske's own songs generally feature very short passages of melody laid down over a swinging beat. These short passages, coming one after the other, combine to give the music a dreamy, surreal quality. But Nieske's songs are always sweetly melodic  as if Glenn Miller had strayed into the avant-garde.